Let’s brighten up this cold and cloudy day with bright blooms and golden hues from our Parisian themed West Weddings summer editorial at Clevedon Hill. What persuaded us to set camp at Clevedon Hall is its versatility and endless options for exclusive luxurious wedding celebration. One of the region’s grandest venues has the charm and grandeur of a French chateau – the perfect setting for a summer fete wedding. Making sure the bride and groom arrived on time, Triggols Vintage Cars kindly provided two of their vintage cars – the 1934 Ivory Sunbeam 25 6 passenger limousine and the 1928 burgundy Austin 12 Tourer. Capturing the details of the day was acclaimed photographer Lee Hatherall, who knew the venue well and really understood the vision for the shoot created by our talented Creative Director, Kirsten Butler from Little Wedding Helper. 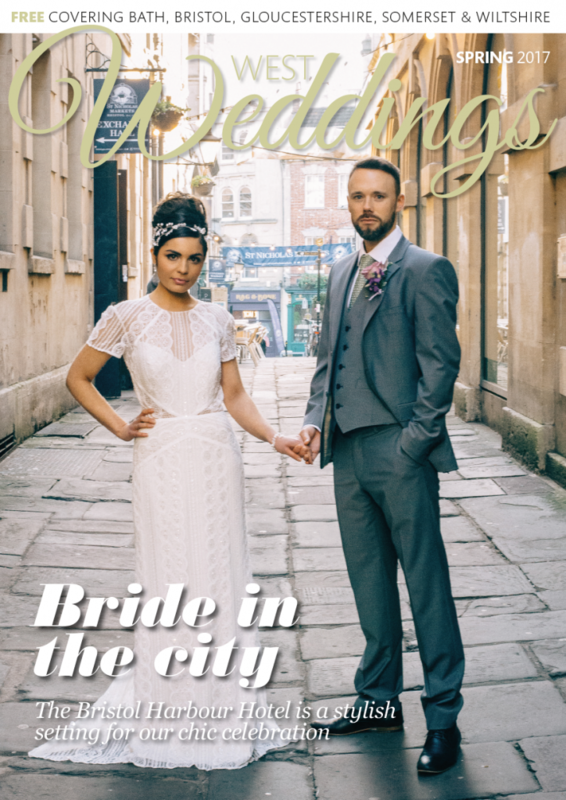 Our bride’s outfits – modern interpretations of Parisian glamour and fairytale princess gowns – were handpicked from The White Collection and accessorised with astounding pieces from Bridezillas. Similarly, the groom wore a selection of smart suits provided by Anne Harding. Once the outfits were chosen, we enlisted the services of Sally Bracey for make up and Tracy Pallari for hair style to get our bride camera-ready. The result was truly astonishing and our bride looked gorgeous in every shot. The adorable ‘chateau’ suite from the de Winton Paperco. stationery in toile fabric featured hand painted watercolour botanic studies in blue, cream and grey colour scheme inspired by rural scenes. The venue was decorated with fresh flowers from Tiger Lilly Flowers, who also provided the bridal bouquets, and delicately trimmed bunting in mauve cotton and sateen created by Beez Neez Bunting. As no wedding would be complete without a cake, we had two deserts – a traditional four-tier cake with delicate details and ruffles handcrafted by Pretty Amazing Cakes, and a colourful French macaron tower from Maison du Macaron.